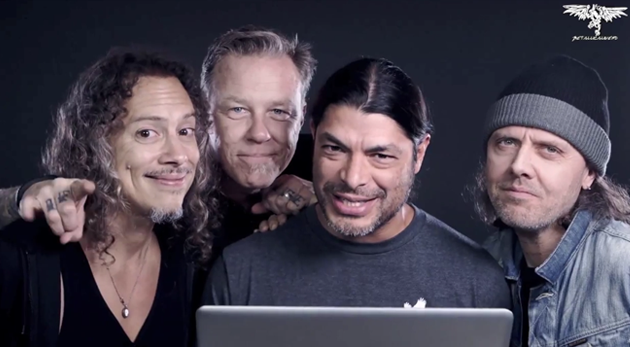 Metal behemoths Metallica are due to release their new album, Hardwired to Self-Destruct, very soon now. Due out on November the 18th, there is a lot of hype around it, as there always is with anything Metallica related. Two songs have been released from it prior to this one and they have really helped to hype it up and that is purely for musical reasons as the first track, Hardwired, is a really good heavy song and the second track, Moth Into Flame, is an all-round excellent song. So now to a third new song, Atlas Rise. Can they do it again? Atlas, Rise is longer than the previous two tracks coming in at 6 minutes and 30 seconds long. It jumps straight in with a pretty simple, maybe uninspiring, but heavy riff over some crashing drums. It soon breaks down into a steadier rhythmic beat before James’ very recognisable vocals join in. The verses are reasonably slow in regards to pace but more because it has a heavy, low toned feeling to it. It picks up a bit in the build up to the short chorus and James Hetfield sounds really good here as he raises his tone an octave or two in line with Kirk Hammett playing a neat little guitar line. The chorus, little more than a line or two ending with a shout of Atlas, Rise, ends with a really cool appealing guitar lead though you have to listen for it in the background. The second verse ends with some more great guitar work before leading into a long solo that is brimming with quality as it moves through different tones and speeds and even throws in duel guitars at points. It really is a top notch solo and invokes strong memories of Metallica of old. The chorus is brought back in and repeated for a few bars while Kirk still plays different little lead lines in the background before it breaks down into a stomping drum and bass heavy riff for 30 seconds through to closing. Metallica really seem to be going all out with this record and they really seem to be embracing old ideas they left behind and new ideas they maybe never picked up. The duel guitar solos on show in this, and in Moth, are great and they even seem to be linking in well with modern ideas on music releases. For example, this song was available for people earlier in the US if you went to a record store, asked for a Metallica mask and then entered a code found on that mask into Metallica’s website. I personally think this is another very good track. I prefer it to Hardwired but it isn’t as good as Moth Into Flame but it has the best guitar work out of all 3 and the new album hype, for me now, is at overload. Strangely though this song could just as easily have been a 4 or 5 out of 10 as I think the intro is a little flat and the verses are a little dull on a first listen. I do like the choruses a lot though but when the guitar solos kick in, it elevates the song dramatically. On a second and third play through I started to pick out little guitar notes and lines in other places that just completed the song. I am so pleased to hear Kirk writing and playing interesting and creative solos and leads throughout. Did I mention the solo is fantastic? Such a good song but you do need to give it a few plays and you must make it to the solo. I genuinely would have marked this 5 out of ten in the first two minutes, 7 out of ten after the solo and 8 out of ten after a second and third play. The new album is due to be released on November the 18th this year and is called Hardwired to Self-Destruct. Atlas, Rise is already available on Spotify and Apple Music as well as most other streaming services. Check out the track yourself on Metallica’s Website and give them a Like or Follow over on Facebook or Twitter. Look out for the new album, maybe even pre order it..
← Previous The GBHBL Whiplash: Episode 11 – Backlash!